Nothing brings people together like how good food does. That’s because food, just like music, is universal. It gets so much better when the food, one is served with, is not just tasty but exclusive. It therefore does not come as a surprise that when it comes to the tastiest foods in North America, New Jersey Food exclusives feature prominently. You cannot find them anywhere else so when you get a chance to savor any of New Jersey’s exclusive dishes, grab the opportunity and enjoy each bite of what you’re offered. To make the most out of your food adventure in New Jersey, try any of the following NJ food recommendations. 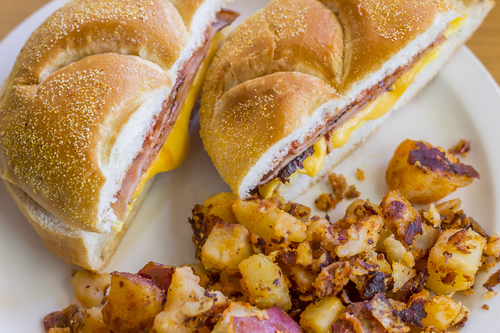 Also known as Taylor Ham, Pork Roll is easily one of New Jersey’s most popular bites. It dates back to 1856 when its creator John Taylor made it popular. It is to New Jersey what bologna is to Italy. Eggs, fried pork roll and cheese on a Kaiser roll bread are some of the main ingredients that make up Pork Roll. Keep in mind that Kaiser roll is another New Jersey specialty, so Pork Roll is by all means a strictly New Jersey affair. Though it is eaten as part of balanced New Jersey breakfast, Pork Roll can also be enjoyed as a midday snack or even a full meal on the go. It also features extra juicy meatballs, which is one of the main reasons why it has quickly amassed a legion of loyal fans. As a testament of how big of a deal Pork Roll is, there is an annual pork roll festival in NJ celebrated each summer. Don’t let the name mislead you. The pie is actually a pizza. No one knows why and who named it pie. There are theories of course about the name, but that doesn’t matter. It is a special type of pizza for many reasons. First off, it breaks pizza rules. While all pizzas worldwide are made with crust first then sauce and cheese and finally toppings, Trenton Tomato Pie defies the norm. Toppings and cheese go on the crust first. Liberal amounts of plum tomato seasoned with salt then follow. This gives the pie (or is it pizza?) a sweet, tangy and savory taste you can’t find elsewhere. It has been designated by many as New Jersey’s unofficial state dish. It was invented at the Belmont Tavern by celebrity chef Stretch. Several eateries have tried to make the tasty dish – roasted chicken evenly rubbed with garlic, herbs, cheese and brushed with vinegar. None has matched the original Chicken Savoy that’s made in New Jersey. No matter where you get your bite though, you can be sure of one thing – it is an American Italian classic chicken dish only found within the confines of New Jersey. You will instantly fall in love with the aromatic and juicy taste with a fine twingle of acid. Forget what you know about hot dogs. New Jersey’s hot dogs will make you question what you already know about hot dogs. There is not just one special or unique kind of hot dog as most people know. There are up to seven kinds, all made in New Jersey. From chilli topped wieners and Italian hot dogs to rippers which are deep fried till they split on their own right in the middle, you have to try them all to have a full Jersey hot dog experience. Isn’t New Jersey a foodie’s have? If you are planning to make NJ your home, be sure to check out the latest real estate listings today!